Paper wrap has been traditionally used to absorb moisture in lumber and wood product packaging across North America. Most paper wrap products are based on a polyethylene based weave. The paper is then laminated on the opposing side. The inside (paper side) will be fastened with the paper touching the peripheral of the wood product. 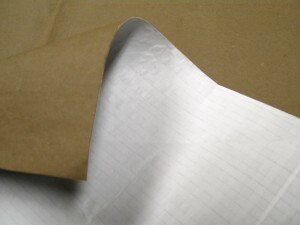 The paper has some effect in absorbing moisture from green lumber or high concentrations of water inside of a package. There are only a few suppliers of laminated paper wrap for use with lumber and wood products. Flexpak often recommends the alternative of breathable packaging, but will supply paper laminated wrap in large quantities upon request. Often prices of paper wrap are 15-25% more in cost than the alternatives of PE or PP products. Contact Flexpak today to discuss more about breathable options with wrap. Switching from paper wrap to a breathable woven wrap may help save money and provide a similar effect to paper wrap.